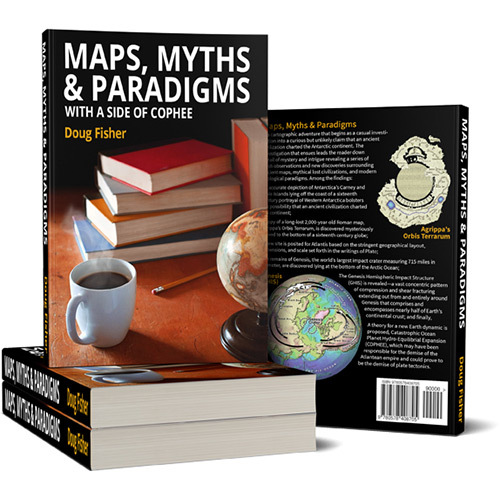 Hello, my name is Doug Fisher, author of the recently released Maps, Myths & Paradigms. The first half of Maps, Myths & Paradigms analyzes ancient maps and along the way delves into Plato's detailed geographical description of Atlantis. While I had discovered a location that matched the scale and layout of Plato’s Atlantis, the observation by no means validated the site as the true location nor confirmed that the fabled civilization actually ever existed. Still, Plato’s description of two continents beyond the Mediterranean—Atlantis and a second large continent opposite a path of islands—is a remarkably accurate description of the Americas and the Caribbean islands that link the two continents. It left enough of an impression that I decided to pursue the Atlantis tale to the next level. I set out to identify the scope and source of the cataclysm that potentially befell Atlantis. Plato’s account appeared to describe a global event with earthquakes occurring inside and well outside the Mediterranean. Research for the second half began with an analysis of terrestrial surface patterns as they relate to plate tectonics. From the start, everything appeared to confirm everything I knew and believed true of plate tectonics and then…Kamchatka happened. 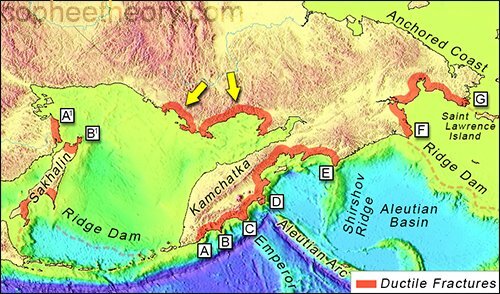 Current Theory: Geologists maintain that Kamchatka originated as a series of volcanic islands that erupted up from the seafloor due to friction generated as the Pacific seafloor plate subducted beneath the Okhotsk Plate. They believe that these islands coalesced into one large island and in turn, this large island expanded further to the north until it merged with the Asian mainland forming the peninsula that exists today (see image below). New Theory: I propose that Kamchatka was the product of fracturing and separation similar to the separation of the Americas from Africa. In support of this new theory, the image below demonstrates Kamchatka’s perfect conformance to a cavity lying along the adjacent Asian coast. Not only does the coastal cavity exhibit a conforming point at the end (left arrow) and hump across its top, there are also two isolated coastal points on each landmass that line up perfectly when the two are brought back together (center arrow). These two coastal points were once joined together as an isthmus. Further evidence that this alignment of coastal points is not mere coincidence exists in a similar set of coastal points that still remain aligned to this day (right arrow). The evidence suggests that Kamchatka fractured free of the Asian mainland along brittle fractures but a small initial area of resistance exhibited ductile extension in the form of an isthmus before fracturing cleanly from the continent. The peninsula then swung counterclockwise out from its perch with one last ductile isthmus forming, fracturing, and undergoing 18 miles of separation, which it retains to this day. We currently acknowledge brittle fractures occurring in continental mass as witnessed in the near-perfect conformance of the Americas to Africa, but plate tectonics appears to have overlooked another fundamental feature of fracture mechanics: Ductile fracturing. Ductile fracturing can occur along the edge of a plate that exhibits ductile or pliable properties. When the plate is stretched beyond its limits these ductile regions give way forming arced voids. In the image below, two arrows mark where the Asian coast has incurred ductile fracturing. 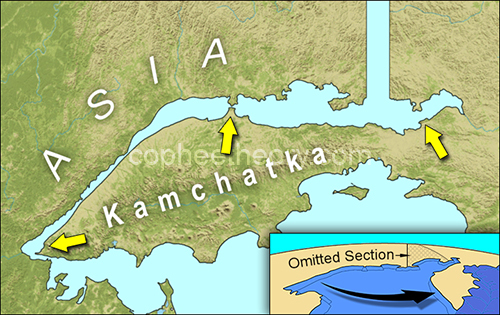 These two ductile openings account for much of the disparity in length between Kamchatka’s western coast and the Asian coast (see inset above to see the span omitted from the main image to attain the appropriate fit). Soon after discovering these two ductile fractures, it became clear that ductile fractures were strewn all about the Kamchatka region indicating the region had been subjected to tremendous stress in the past. It also became clear that there was a direct relationship between many of these continental ductile fractures and seafloor ridges which currently are attributed to hotspots. I propose that continental crust and seafloor crust have a relationship that is much like that of a wooden frame to canvas. 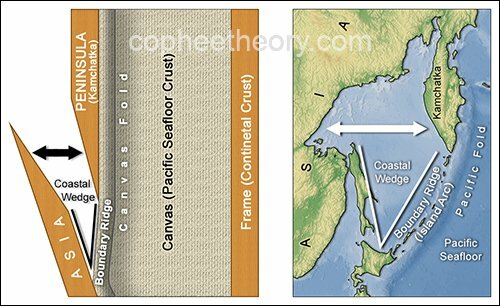 Just as an open-mode fracture in a wooden frame rips a void outward into the adjoining canvas (see image below), so a continental open-mode fracture rips a void out into the adjoining seafloor. While the tear in the canvas leaves a void, the void created in the seafloor crust is filled by magma lying beneath. The ridges form the boundaries between old seafloor and new and vary in size based on the instability between the two during plate movement. I also propose that island arcs, currently believed to be formed by subduction and friction, are actually the product of in-plane shear fractures where some continental crust has fractured free and pulled away from the seafloor crust while portions of continental crust remain attached. Once again, this basic phenomenon can be replicated on a wooden frame and canvas. Notice in the image below that in both instances portions of the frame and continental crust have fractured and moved away from the canvas and seafloor crust. The separation has resulted in a downward V-shaped void versus the outward V-shaped void incurred by the open-mode fracture demonstrated above. Similar to the open-mode fracture, the seafloor void has been filled by magma lying beneath. Note in both instances that the V-shaped void lies immediately below the two fractured surfaces that perfectly conform to each other. Rather than the plate boundary existing at the bottom of the adjacent trench as currently maintained, the island arc is the actual boundary ridge separating the new seafloor from the old. In the example below, the older Pacific Plate is bonded to the newer Okhotsk Plate at the Kuril Island Arc. While the trench lying alongside the island arc is currently believed to be proof that the Pacific Plate is subducting beneath the Okhotsk Plate, it is actually a fold within the Pacific Plate. Kamchatka, Japan, and Korea are splinter fractures that have remained attached to the Pacific seafloor crust while Asia has traveled westward. 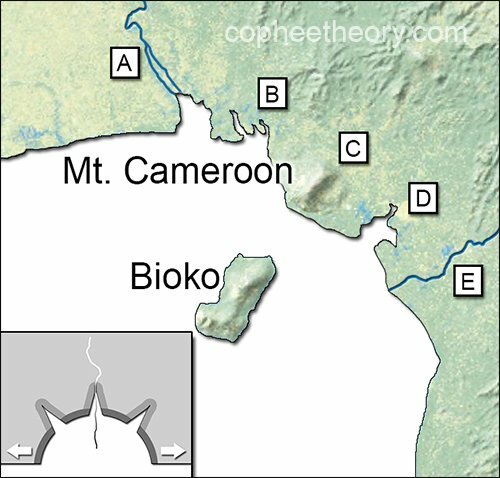 Although many examples are offered up in Myths, Maps & Paradigms, one notable example of a perceived hotspot ridge is the one that defines the Cameroon line. The Cameroon line has long been regarded as a product of the African Plate moving across the Cameroon hotspot. I believe what has been overlooked is the arced bay which surrounds it, the Bight of Biafra. This once again appears to be a ductile fracture and in this instance, the fracture continues inland as a brittle fracture. Instability within the brittle fracture during plate movement has allowed magma to seep through forming the inland ridge. Meanwhile, the adjacent seafloor, which is directly attached to the coast, has been subjected to the same partial separation as a result of instability in the continental fracture thus also allowing magma to seep through creating a chain of volcanic islands. Further confirmation of fracturing can be seen below in the enlarged image. The brittle fracture known as the Cameroon line (C) runs directly down the center of the arced ductile fracture while secondary fractures (A, B, D, and E) lie to either side. These secondary fractures can take the form of smaller bays or inlets and often extend further inland as riverways. As demonstrated below, symmetrical secondary fracturing is a common natural trait shared by many ductile fractures. 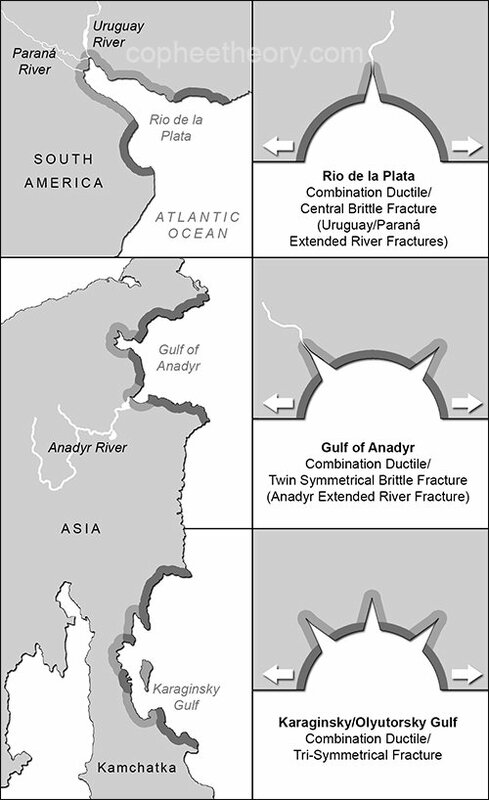 The Karaginsky ductile fracture exhibits similar symmetrical secondary fracturing as seen in the Bight Biafra. Also of note in the examples below, it is common for rivers to flow along brittle fractures. As noted in Section III, I believe that the oceanic trenches lining the western Pacific are seafloor crustal folds. Seismic activity occurring in Benioff zones extending from the trench to well beneath the overriding plate is due to shifting within the fold and extends to fractures resulting from the tight fold. By no means is the Pacific Plate completely independent of the Asian continent and subducting beneath it. How can we be certain? 2. Take special note of the ridges in the image of the Kamchatka region below. Note that one of those ridges is the Emperor-Hawaiian seamount chain (C) and it still remains aligned to the cusp of a ductile fracture. Moving the Pacific Plate significantly forward or backward in time would find the ridge further north or south of the cusp. Likewise with the Aleutian Plate alignments. 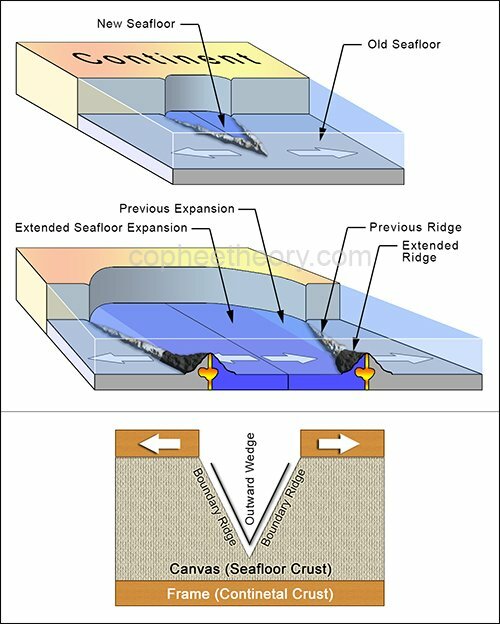 Only minor convergence between plates would allow for the multiple retained alignments, thus seafloor folding is the most logical explanation for the formation of seafloor trenches as it allows for the least amount of seafloor displacement. Ascribing alignments between ridges and ductile fracture cusps and centers, in the Kamchatka region and throughout the globe, to the random movement of crustal plates over hotspot ridges defies all odds and logic. In conclusion, I believe fracture mechanics—a very basic observable dynamic that formed the basis of continental drift and plate tectonics with the realization that the Americas conformed to Africa—was abandoned far too early in the process of analyzing Earth dynamics. Maps, Myths & Paradigms provides a fresh new view of terrestrial surface patterns with an eye toward fracture mechanics and sets forth consistent unifying theories for seafloor ridge and peninsular formations as well as coastal fractures and their immediate observable effect on the adjacently attached seafloor crust. Based on planetary surface analysis, by means of topographic and bathymetric maps, the evidence is overwhelmingly in favor of fracturing continental plates and separation with little to no long-term plate convergence. This, along with the Emperor-Hawaiian seamount chain’s retained alignment with a continental fracture cusp, strongly suggests that plate subduction is not occurring and, by logical extension, plate tectonics is a failed theory. This would appear to leave us with only one remaining option for an Earth dynamic: Earth expansion. Re: Plate Tectonics: A Modern Myth? It’s clear that you do not believe in Earth expansion, but thanks for the reply. Can I assume that you had no issues with the first four of my discoveries? It is really hard to imagine how geologists overlooked the very obvious conformance between Kamchatka and the adjacent coast. Geologists are currently struggling to explain how two parallel mountain ranges exist on Kamchatka when subduction and island arc formation only allows for one row of mountains. Meanwhile, the valley these two ranges form between them aligns with one on the mainland when Kamchatka is placed into the adjacent coastal pocket. It makes far more sense that the mountains and valley formed when Kamchatka was embedded into Asia’s coast.